Stamford Talk: Eat, Think, Drive, Blog! : Missing Stamford Show Dog FOUND! Oh no! This dog's owners need our help. Scratch that! They just found him last night. That's good news. For some reason, the article about him being found is not on my Advocate RSS feed yet, although it's on the feed for the Greenwich Time, to which I do not subscribe. Whatev. Bailey, a bearded collie, escaped on Wednesday from his house off Newfield Ave, just south of the Merritt in Stamford. 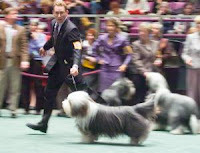 Bailey had just retired after winning best of breed at the 2007 Westminster Kennel Club show in NYC. His breed are herders and tend to chase cars, so his owners are very worried. Bailey was spotted in Greenwich on Thursday, so please keep your eyes peeled for this gorgeous dog if you are out and about in the area. Call 977-4437 (Stamford Animal Control) if you think you see Bailey. You can read a more detailed article at the Advocate. Am I the only one who thinks it's ridiculous that this is news? Hmmm wait, did that dog get special treatment bc he was famous? Ah well. He's still a dog, and they need us humans. Some perspective - The NY post has been full of cover! stories about the boyfriend who kicked his girlfriend's supposedly jealous and vicious cat dead for 3 days now! True about the NYP, but that's because the dude was crazy! This is a missing dog. A missing dog! How the heck is a missing dog front page news? Can we maybe instead focus our energy on feeding some hungry kids in FC?